If you are looking to host a charity event or raise money for a particular cause, you will need to create tickets to track incoming proceeds or entrants. Whether your event is formal or informal, there are customizable options below. 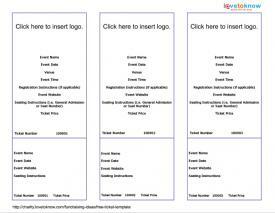 Below are three different templates for tickets that you can customize for various charity events. If you need help working with Adobe printables, use this guide. Click to customize the formal template. The line items on the printable image above can be customized to best suit your needs. To customize, click on the face of the document and replace the contents of the PDF with the correct details for your event. Click to customize the casual template. Click on the image to download the tickets, and then you'll be able to customize them. The items on the printable image can be tailored to best suit your needs. On the face of the ticket, you should also disclose if the ticket holder must be present at the drawing to win. The tickets should be numbered sequentially and printed on card stock paper. For the best tickets, keep the following tips in mind. Be sure to scale your logo down to the appropriate size if you are creating tickets for casual events or you wish to use it in lieu of your organization's name. If the logo is too large, you risk cutting it off of the ticket, or printing a blurry image. Formal Fundraiser: Print on black card stock paper and use white text. Casual Event: Print on white card stock paper and use dark blue or green text. 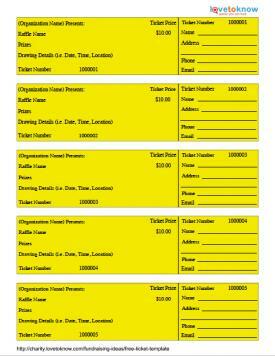 The yellow background and black text is customary for raffle tickets. 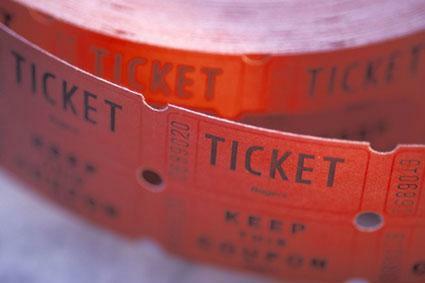 TicketPrinting.com and Hall Letter Shop Inc, offer a variety of raffle and event ticket templates for every budget. Upon entering either website, you can peruse their pre-designed options and select one that fits your color scheme and is within your budget or upload your own design. TicketPrinting.com also provides free samples and allows you to create your design from scratch directly on the website. 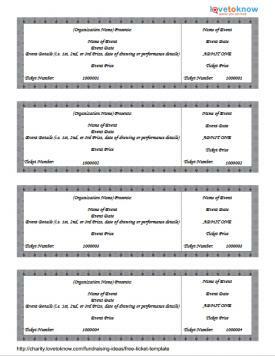 Use these printable templates or one of the recommended websites to create professional grade tickets for your next charity event or fundraiser without spending a fortune. Saving money on printing tickets means more money can go towards your charity.